Famine. Death. War. Pestilence. These are the harbingers of the biblical apocalypse, of the End of the World. In science fiction, the end is triggered by less figurative means: nuclear holocaust, biological warfare/pandemic, ecological disaster, or cosmological cataclysm. But before any catastrophe, there are people who see it coming. During, there are heroes who fight against it. And after, there are the survivors who persevere and try to rebuild. Table of contents and audiobook narrator listings copied directly from John Joseph Adams’ website. If you want more detailed summaries of each story, I found the review at Tangent very good, particularly because it is so hard to keep track of short stories when you are listening instead of reading! The audio was an incredible asset to this anthology, although I will probably also need to buy this for my shelf o’ anthologies. The best in audio are Removal Order, BRING HER TO ME, and The Fifth Day of Deer Camp. My favorite stories were BRING HER TO ME and Goodnight Moon. I’m most interested in the next installment (so please let there be a next installment) of Removal Order, Pretty Soon the Four Horsemen are Going to Come Riding Through, and Spores. What do I mean by next installment? 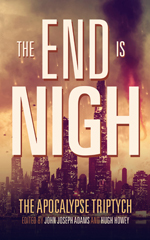 The End is Nigh is the first volume of a triptych. It will be followed by The End is Now and The End Has Come, with some authors contributing linked stories. Very exciting concept, and as the Queen of Apocalypse there is no way I couldn’t read this. Here are my more detailed impressions, story by story! “Post-apocalyptic fiction is about worlds that have already burned. Apocalyptic fiction is about worlds that are burning. End times and a preacher rises up. Aliens forcing humans to be enforcers of their own people, in preparation for a worldwide move to Planet X. You can read this story on Wired.com. What does it take for gay marriage not to be an issue? How about an earth-destroying asteroid? Sounds campy but isn’t, very present-day pending doom. A very sad story that left more questions than answers and I hope it continues in the next anthology of the triptych. The narrator was perfection for the tone of the story. Comet story. Honestly I forgot it already! Creepy. I hope God never speaks to me. 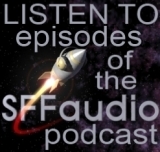 A must-listen in audio. In the same world as Wool, a father elects not to go to the silo even though he knows the world is ending. This story is the last day with his family. After reading all of the Silo series I appreciated this on-the-ground story. Astronauts facing certain death. No really, certain. I thought it was lovely. A decently interesting virus premise, a drastically mundane setting. In this pending apocalypse, the world is running out of oxygen, which will be certain doom. One person’s roommate responds with art. Oh my gosh, you must get the audio for this one. The author does a great northern Minnesota accent for this of what would make a great story from deer camp if these guys can survive. The first of two stories that include a the interruption of the earth’s orbit. This one is more connected with a physicist and an important discovery. The end is near and it is a FUNGUS. Of course. Not quite as creepy as her Parasite novel but has more heart, and really more about living with OCD than it is about the end of the world. Another story about the earth’s orbit, this time with more cults! This story feels very much like straight zombies, but okay, we can call it a virus. This one can only have an emotional response. I was driving when I listened to it and I almost threw up. Horrifying but would have been more believable if the characters had more to them. The relationship between the most important two never made sense. A story about a reporter and a photographer covering the water crisis on the border between Arizona and Texas, which are now separate countries. Mad Max and an apocalypse lottery. Some of these can be read for free on the Apocalypse Triptych Website. Destructomundo! How Do You Stop It?!! ?